August 17 (NIA): In a tragic incident early in the morning on Wednesday, four baby elephants, were killed when they got in the way of a speeding train near Madu in North West Sri Lanka. The elephants were crossing the track when the Colombo bound night mail train dashed against them, police said. The accident occurred between Madu and Chettikulam in Vavuniya district. The police in Parayanankulam and the Wild Life Department have launched investigations into the incident. A Sri Lanka Railway official told NIAthat that the accident had taken place in a spot which was not frequented by wild animals. “The Wildlife Department together with the Sri Lanka Railways have been trying to identify paths where wild animals usually roam around. Along these routes trains usually reduce their speed and are very cautious. Wednesday’s accident took place in an area where there have been no wild life movements,” the official said. He added that the four baby elephants had been hurt when they suddenly moved on to the tracks while the train was crossing. One baby elephant had been dragged meters away. In Sri Lanka 100 to 150 elephants are killed each year. In 2009, about 200 were killed. Over 50 people are killed by elephants. Elephants are being shot, poisoned and electrocuted by irate farmers, whose crops are eaten away or simply destroyed by intruding elephants. 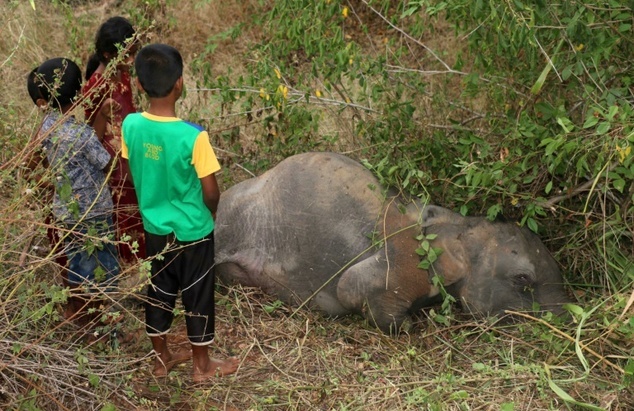 The elephant is endangered and it is illegal to kill them, but villagers are desperate. Sadly, elephants are dying in other ways as well, hit by trains, falling into wells, or blown up by landmines planted during the 30-year war in North and East Sri Lanka. Places like the Elephant Transit Home (ETH) in Uda Walawe National Park are working to rehabilitate elephants that are orphaned or injured, but even they can’t seem to solve the problem that the elephants face. But once they are rehabilitated and released back into the wild they wander back into villages only to be shot or poisoned. The ETH keeps human contact to a minimum to make sure that the elephants do not become accustomed to man, but with loss of habitat and very little room to roam, the elephants are running out of safe space and wander into inhabited places, crossing roads and rail tracks which has become hazardous.